Anesthesiologists and Certified Nurse Anesthetists administer Propofol (Diprivan), a common sedative-hypnotic medication, for the induction and maintenance of anesthesia. Propofol is rapid acting and produces little if any post-op side effects. Propofol can also be used to lightly sedate patients undergoing mechanical ventilation and other minimally-invasive medical procedures such as prior to or during an endoscopy or discogram. 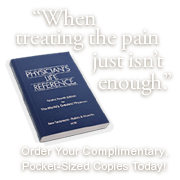 Pain Management physicians will occasionally make this type of sedation available to patients who present with anxiety or where sudden movements during needle placement would be potentially dangerous in patients who respond violently to even small levels of stimuli. Our topical anesthetics reduce discomfort during specific medical procedures. topical anesthetics are supplied in creams, sprays, jellies, aerosols, ointments, or solutions. Topical Antibiotics are applied to skin or mucous membranes to prevent and/or treat infections. These infections or potential infections are typically the result of exposure to bacteria. Transdermal Patches are used for the treatment of and prevention of various diseases and/or injuries. Transdermal Patches deliver a controlled, specified dosage of medication. Other topical medications are applied to the skin or other topical tissue. They are typically supplied in creams, sprays, jellies, aerosols, ointments, transdermal patches, or solutions. Respiratory Inhalers provide inhalant solutions for patients suffering from Asthma, Bronchitis, and other respiratory conditions. The optimum outcomes are a reduction in airway swelling.